Dr Forbes Hut, one of Kosciuszko’s five river stone huts, has been rebuilt again following the 2003 bushfires. The original hut, constructed of slabs, burned first in 1939 and was rebuilt in river stone. This river stone hut came to be known as Dr Forbes No. 2, named after the son-in-law of the Nicholson family who used the original slab hut, and this second reincarnation, as a base for fishing (which is ideal given it’s location within the Geehi area along the Swampy Plains River). Like No. 2, this latest reconstruction is: a single room, gable roof structure; with a verandah overlooking the river; a chimney made from two 44 gallon drums; timber shutters instead of glazed windows; and corrugated iron roofing in short lengths as up until 1956, access to the hut was by pack horse. The reconstruction has been led by National Parks and Wildlife Service carpenter, Garry McDougal, assisted by contractor Geoff Becker and dedicated volunteers from the Kosciuszko Huts Association and the Perisher Historical Society. Photo: Dr Forbes Hut as it nears completion in late April, Garry McDougal (NPWS carpenter) and volunteer John Anderson re-pointing stone walls. 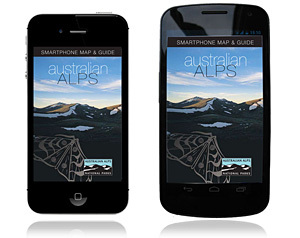 The Australian Alps has around two hundred historic huts. With some dating from the 1860s, the huts come from every era of European history in the Australian Alps. They were built for simple shelter by graziers, gold miners, foresters, government workers, skiers and bushwalkers. Huts have always been left unlocked, stocked with matches and a small amount of dry firewood and kindling. People generally looked after each other. They needed to if they were to survive the rigours of mountain life. This tradition, maintained today, has helped many people in trouble and will undoubtedly help more, maybe even you. These huts represent part of the rich cultural heritage of the Alps and the huts need to be managed to ensure their survival. No matter what kind of activities you enjoy in the Alps, you can minimise the impacts you have on the environment and other visitors by following some simple rules. Challenge yourself to leave as little trace of your visit as possible. Care for the Alps now – so they’ll be just as wonderful in the future. There are a number of well-known huts in the Yarrangobilly region including Currango Homestead, Long Plain, Coolamine and Oldfields huts. Also well-known in the Victorian High Country are Wallace’s Hut and Cope Hut, in the Bogong region. If you fill in the book stating the details of your journey, number in the party and intentions, it may assist in search and rescue operations. If the log book is full, please inform the park service responsible for the hut and it will be replaced. Plan for every situation, take shelter before you get wet and tired. When mountain weather closes in huts can be difficult to find. Ensure you are equipped to camp out as blizzards can occur any time of the year. In severe weather, take shelter early before you get wet and tired. “We woke early on the 13th July and set off in still conditions with fresh snow flakes gently falling. Graeme was so hot he stopped to take off his jumper. 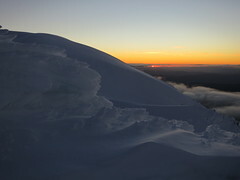 We rounded a long ridge running south of Jagungal, where the wind first hit us with a sudden icy blast. We were about halfway to Mawson’s Hut and pushed on. By the time we skied down the valley we were wet through on the windward side. Climbing up a creek on Cup and Saucer Hill the wind was to complete the job, so that we were now wet all over. Eventually we came upon the Valentine River which we could recognise by its distinctive ice pools. We followed it south trying to locate our landmarks. The poor visibility affected our sense of scale. Wet and demoralised we headed east before the wind. The strategy here was to ski over the range out of the strong westerly wind, into the tree line and perhaps to Alpine or Kidman’s Hut. The wind was unbearable at the crest of the ridge so we decided to dig snow caves behind a huge rock. The caves were half completed when the weather cleared to the east, the wind and clouds still gusting in from the west. This short view showed us Burrungubuggee Creek and to the left, the Bulls Peaks and to the right the Big Brassy. Alpine and Kidman’s Huts were in easy reach, down the valley and out of the wind. Our feet and hands were frozen and the cold relentless. We decided to ski down. At very worst we could bivouac in the trees and perhaps make a fire on the snow. I skied one leg of about 200 yards and then turned and fell, losing a ski downhill. I chased after it madly and when I found it, I waited impatiently for Graeme behind a snow bank only three hundred yards from our old snow caves. Graeme always took pains to stay ahead of me. What was he doing? Was he in trouble? Leaving my skis, I ran up the bank and found him trying to stand up after a fall. His socks were down and his legs cut by ice. He could hardly talk. ‘Did you ski down here?’ – came out slowly as if he were drunk. It was exposure – there was no doubt. I helped him down, carrying his skis to where I had left my own gear behind a snow bank. He seemed completely incapable of doing anything to help himself. I dug a shallow ditch in the snow and put him in his sleeping bag and bivvy bag. 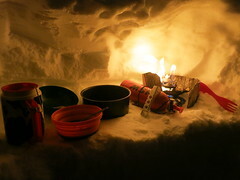 I was now feverish with activity digging a snow cave with a fry pan, building a wall with excavated snow, feeding Graeme biscuits and trying to reassure him. I tried to elicit some intelligible response from him. When all attempts failed and the snow cave was half finished I became really worried and dragged Graeme inside. He was impossible. His body stiffened against me as I tried to drag him to my own cave. He kept trying to crawl out and after a while I let him. He lay outside in his sleeping bag staring at the sunset in the valley below beyond our reach, while I dug his cave deeper. When it was done I tried to drag Graeme back inside. He resisted every effort and it was only when I lost my temper completely that I could muster enough strength to force him inside the cave and out of my way. I was exhausted and very alone and quickly set about digging my own cave. It was not really big enough. I felt shooting cramps in my legs whenever I knelt. I had never had cramps in the body before and began to worry about myself. Soon I was in my own sleeping bag and bivvy bag,my pack at my head over the entrance. Graeme’s head was in my lap and I tried to warm him. He was in deep sleep breathing heavily. I was jubilant. We were both alive. Pictured here circa 1940, Victoria’s Weston’s hut is a prime example of a site valued for many reasons. It has long term links with high plains cattlemen families – the Westons and Goldsworthys – who generations ago decided where it was to be built and from what. 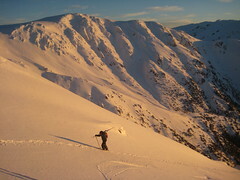 The hut has high value as a refuge given its location on a key walking route between Mt Feathertop and the Bogong High Plains. Not surprisingly, when it was burnt in the 2006-07 fires, it was rebuilt. Taken from Alps news #42. Some of Australia’s most valued real estate is tucked a long way away from any sealed road. Often only a single room plus lean-to, these simple buildings are dotted across the vastness of the Australian Alps – iconic shelters built with purpose. And it’s through the very real reasons that these huts were created that so many people feel a connection, often generations after they were built. The care of these structures lies in the hands of parks agency staff who simply couldn’t achieve what’s necessary without volunteers from the various alpine huts associations. Speaking with just three people responsible for managing huts shows how easy it is to be caught up in their magic..
Perhaps people so often react this way simply because a hut is a tangible object which shows that other people were here before us. And for those who know how to look closely, there are complex stories to be told, simply through the adze marks on a piece of timber. Run your hands across the surface and you’re touching a moment in another time. Knowing the stories – the cultural value based on the context of a structure – is vital to managing and protecting a site. It’s not simply a case of popping a new structure in the same spot when the original one finally crumbles (although there are instances where the new huts have been reconstructed). There is too much in the original fabric of the structure to lose if this happened, which is why so much unseen effort goes into taking stock, and making sure that this stock taking is made by people who know what they are looking at. Typically, rangers and volunteers from the huts associations together assess the sites – both to determine their heritage and social values, but also with the view of ongoing maintenance. Originally built in 1939 by Tom Oldfield, his son Jack and Harry Tyrie, conservation works were carried out at Waterhole hut Namadgi National Park (ACT) in 2003-04. In December 2010, ranger Dave Whitfield on a routine inspection discovered the hut under a fallen tree – the likely cause being the recent high rainfall. Once the tree was removed, much to everyone’s relief none of the conservation work had been affected apart from a few ‘dings’ in the iron roof. Chris also points out a continuity that may not be obvious at first glance, that huts are usually well positioned, and not by chance. Very often the people who took cattle into the Alps followed the existing pathways of the First Peoples. They’d build their huts where there was natural shelter and water, often at a place where these pathways crossed – places where people had always camped. According to Jennifer Dunn, Megan Bowden, a ranger with the NSW Parks and Wildlife Service is also a ‘hut nut’. Part of Megan’s role involves the logistic coordination for huts maintenance through to reconstruction of huts burnt in 2003- a challenge ramped up by the location of many of the sites in Kosciuszko National Park. Megan explains that rangers are ultimately responsible for the huts in their patch, and are guided by a management plan for each. This to do list and significance assessment has been put together by a heritage consultant in consultation with the ranger and with each hut’s volunteer caretaker group. While the items on the list may be familiar to most home owners – roofing, drainage, stumping – for huts, a slightly different approach is necessary. “The aim is to carry work out in a balanced way – to do as much as is necessary but as little as possible – to retain as much of the original fabric but keeping in mind that you don’t want the hut to fall down.” For example, if a hut’s original stumps are timber, replacing them with obscured concrete equivalents may extend the huts ability to weather longer before the next maintenance intervention is needed.